The bill households receive from Watercare estimates 78.5% of water that enters a home goes down the drain. For the average Auckland home that equates to around 115,000 litres a year. Each time we flush a toilet, wash our dishes, or have a shower, the bulk of the water used is sent down the drain and treated as wastewater. But a lot of that water can be recycled around the home. Around two-thirds of a home’s water usage1 is in basins, showers, and washing machines. Wastewater from these sources could be recycled for use in flushing toilets or watering the garden. On a household level this would reduce the amount water needed to be supplied by Watercare, which would reduce the volumetric component of the water bill. And on a city-wide level it would cut the volume of wastewater needing treatment and pumping around Auckland’s 7,700 kilometre long wastewater network2. It would also reduce peak demand on that network, meaning fewer upgrades to infrastructure. Two-thirds of a home's wastewater could be recycled for use in flushing toilets or watering the garden. Greywater is the waste water mentioned above - from showers, basins, and washing machines. A greywater system collects this water and recycles it for another use within the home instead of sending it to the sewer. Typically, greywater systems recycle water for toilet flushing or irrigation. 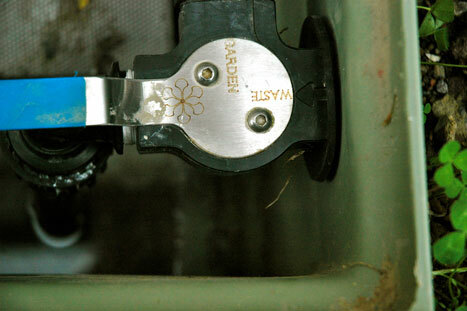 Most systems include a storage tank in which the greywater is held until it is required for use. To avoid build-up of harmful bacteria these tanks usually require the addition of chlorine on a daily basis. There are also systems available that have no storage and filter the greywater before pumping it straight out to an subterraneous irrigation system. As there is no storage, there is no chance of bacteria growth within the water and therefore no treatment is required; the water is cleaned by the bacteria in the ground. With either system it is important to use only biodegradable products in the house. 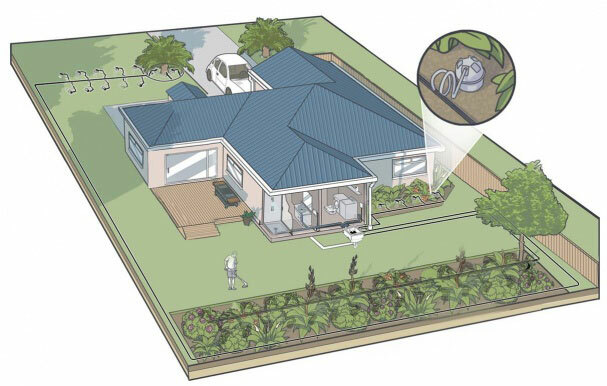 The WaterLille system from Watersmart sends grey water to the garden when moisture levels are below a set level. We installed a WaterLillee system from Watersmart. This is one of the latter types of systems described above, i.e., does not store water so does not require treatment. The WaterLillee system captures wastewater from the showers, basins, and washing machine and distributes it to the garden for irrigation. Moisture sensors measure when the garden is sufficiently watered and the system then diverts excess grey water to the wastewater network. This approach can work well in combination with the rainwater tank, which also supplies water for the garden. The garden requires most irrigation during summer, when the rainwater tank level is lower; recycling grey water from year-round water use such as showers ensures a stable supply of water for the rest of the year. Blackwater systems are also available in New Zealand. Blackwater is the wastewater from the kitchen sink and toilets, although blackwater systems usually treat greywater as well. Probably the most common form of blackwater system in New Zealand is the septic tank, where some of the solids are digested by anaerobic bacteria and the remaining fluid drains off to the surrounding land. Newer blackwater system technology includes a second stage in the treatment process which helps the sludge break down further than in a septic system. Again the treated water that comes from this type of system drains off into the surrounding land. Until Auckland's wastewater guidelines are updated the water we could use to irrigate the garden has to be sent to the sewer. All greywater and blackwater systems that are installed in Auckland must meet Auckland Council's on-site wastewater system's guideline TP58. TP58 was written for blackwater systems with storage, which have in the past been used on large rural sites. As mentioned above, the new greywater irrigation systems take a different approach by not requiring storage. And even though they only take greywater they are still required to be approved under TP58. Because TP58 does not consider these types of non-storage greywater irrigation systems, it is virtually impossible to consent for use on small city sites Auckland - even though they have been proven to be safe. We believe there is a strong case for allowing greywater recycling in Auckland and are confident the Council's guidelines will be updated to permit these new types of systems. We've therefore installed the WaterLillee system and constructed the house with separated greywater and blackwater outlet pipes so it can be switched on when allowed. Build Magazine. February/March 2009. Getting a handle on water use in Auckland homes, table 1, p66.